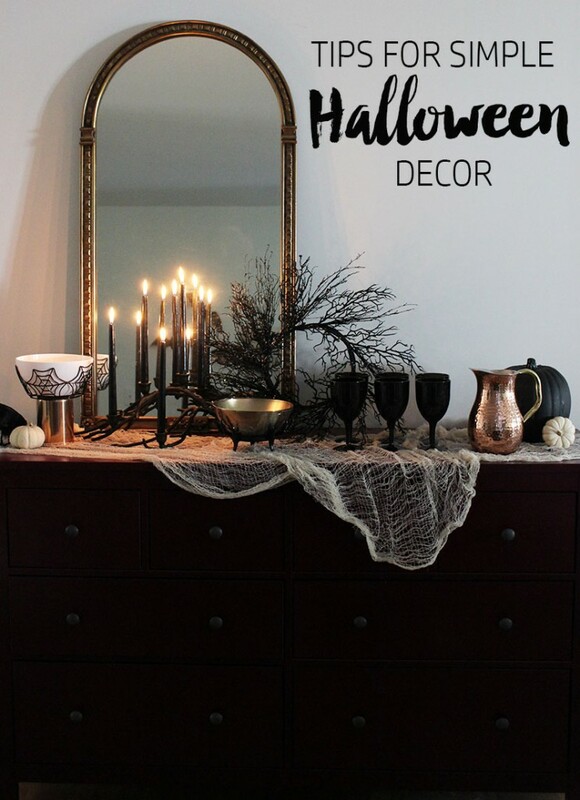 I’m so excited to be joining with some other bloggers and Wayfair to help you plan the Ultimate Halloween Party! Each day, a different blogger shares their expertise in planning the perfect party. I’m in charge of decor ideas and I had a blast putting some together for you guys! During this series, you’ll find everything from food to costume inspiration, so make sure you follow along. 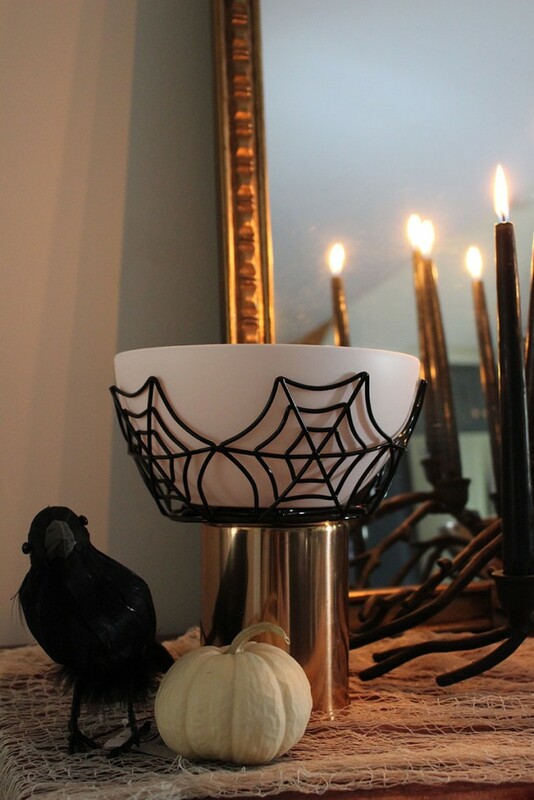 While I’ve always loved this holiday, I tend to not go for the super scary or traditional more-cheesy decor. 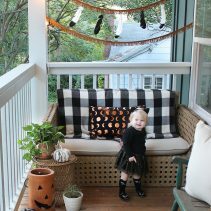 My goal with this Halloween party decor was to create a stylish and simple party decor plan. I started with a very basic color scheme. To create a high-style party design, I opted for a classic black and white palette. 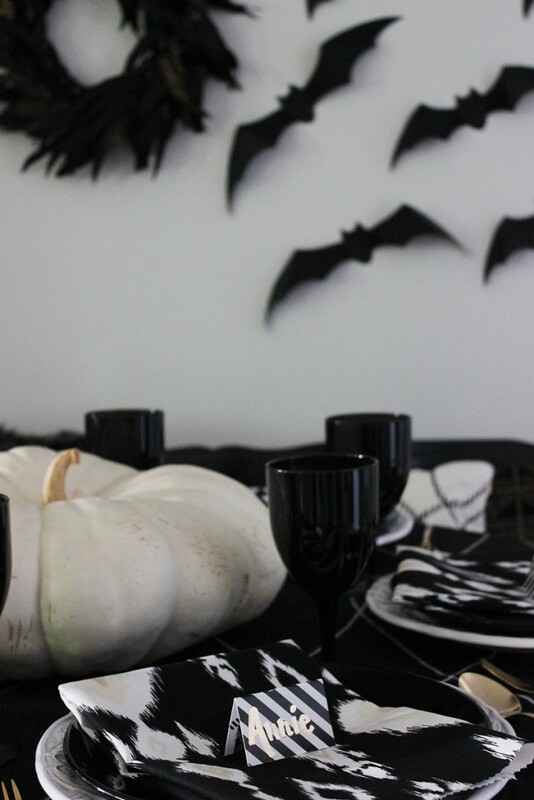 I love the graphic contrast between these two colors and only using them for the party decor creates a modern spin on traditional Halloween decor. The best part about using this paired-down palette is that you probably already have things that would work! 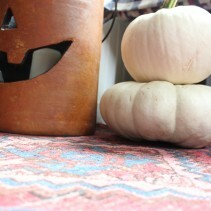 You don’t need to buy seasonal decor. 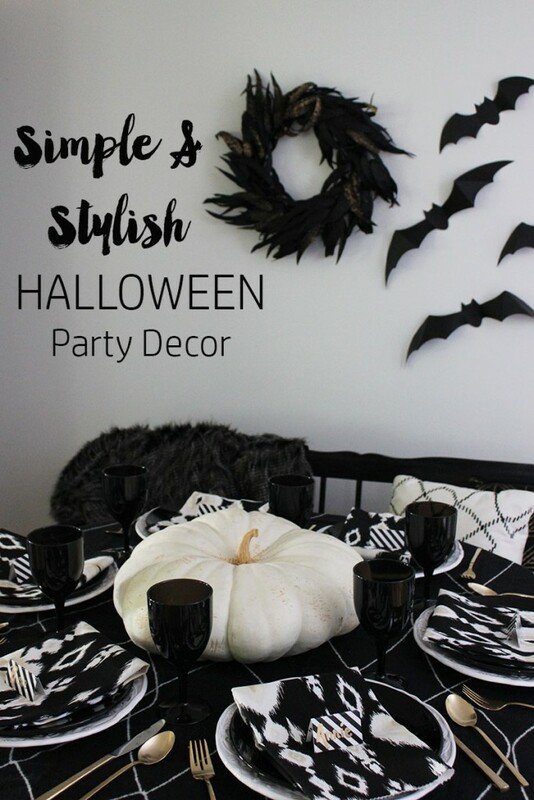 Just bring out your black and white decor, add in a few seasonal touches, and you have yourself an awesome Halloween party! While these two colors create great contrast alone, I love to play with pattern and really have fun with textiles. I used this black throw with thin white lines as a tablecloth. 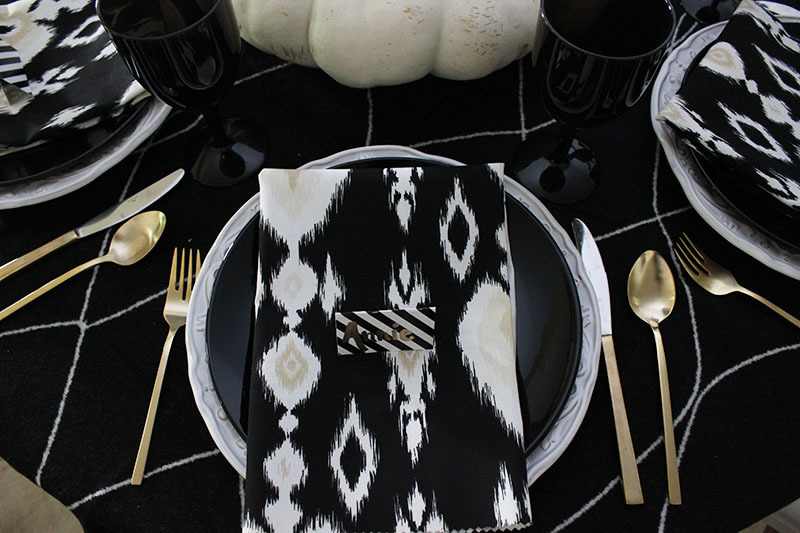 The black and white ikat napkins really pop against the more geometric and subtle pattern of the throw. 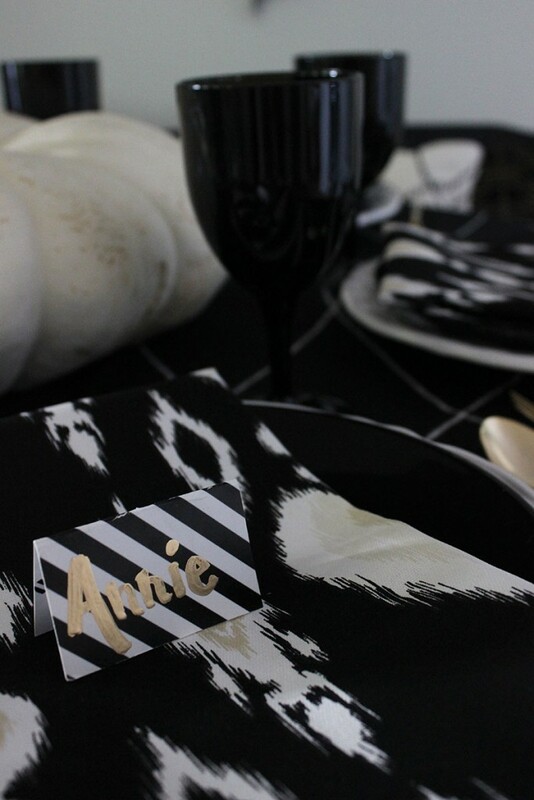 The black and white diagonal stripe on the place cards really contrasts against the more organic pattern of the napkins. While I love a very intricate and layered tablescape, you don’t always need that. A simpler party can be just as stylish, especially when you have mixed patterns with the textiles. They create great interest and really allow you to choose pretty, simple finishes. I love keeping a variety of scrapbook paper on hand to make quick folding place cards. I have a wide range of colors and patterns, so there’s always one to match the current table I’m working on. Handwritten names in gold paint pen create a finished look without taking too much effort. 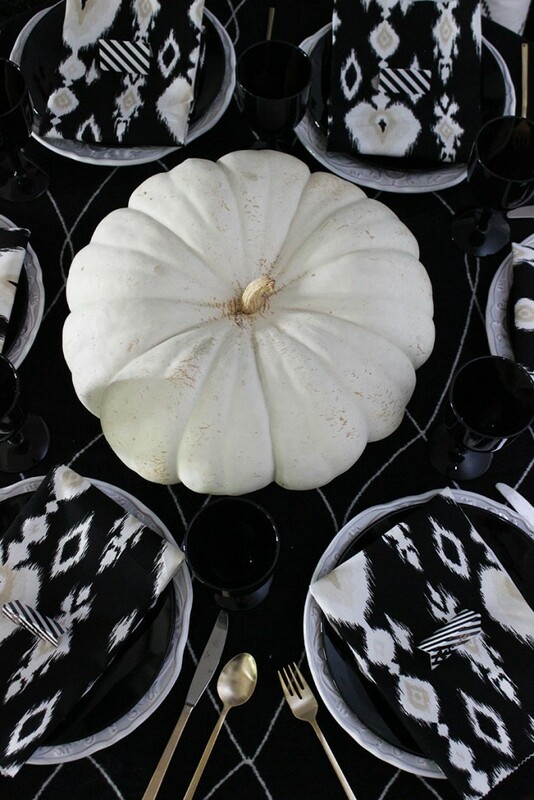 A large, white heirloom pumpkin is the perfect centerpiece for this table! It sticks with the color scheme, brings in a natural element, and plays to the season. 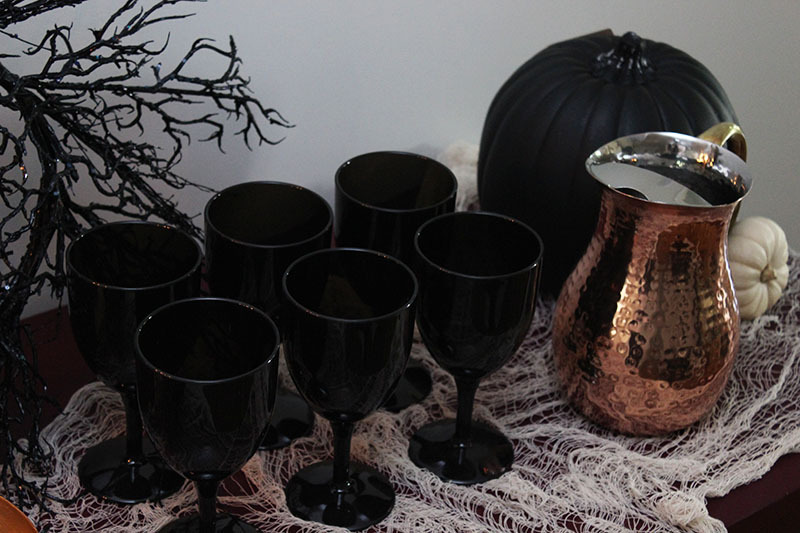 And black goblets fit the theme perfectly without drawing too much attention and taking away from the overall look. Who says stylish party decor has to be all serious? Sophisticated fetes can still have a little fun! 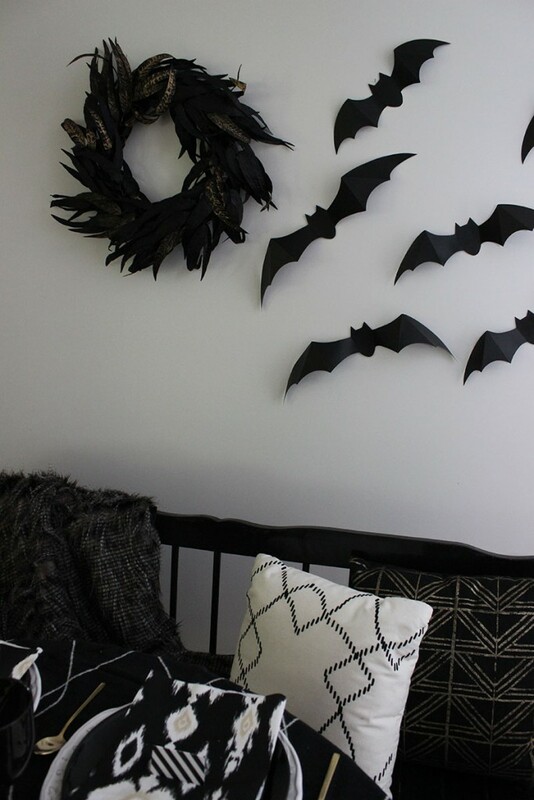 With this black and white color scheme, some “flying” bats and a black feathered wreath along the wall add just enough spook. When throwing any party, it’s easy to only think about table decor, but you’re missing so many opportunities! Setting a festive table does go a long way, but creating some stylized vignettes and moments throughout your home really takes your party to the next level. 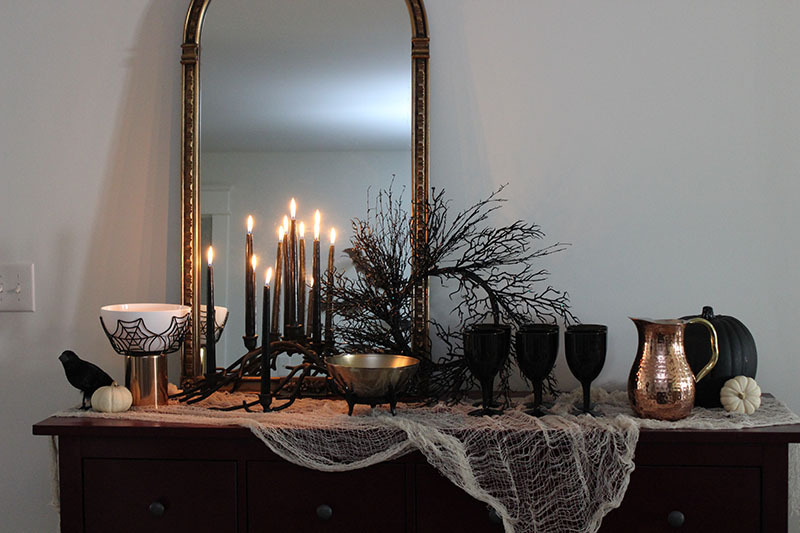 For this stylish and sophisticated Halloween dinner party, I styled a little Halloween fun on our dining room buffet. Create a base with some cheese cloth that sets the right mood. 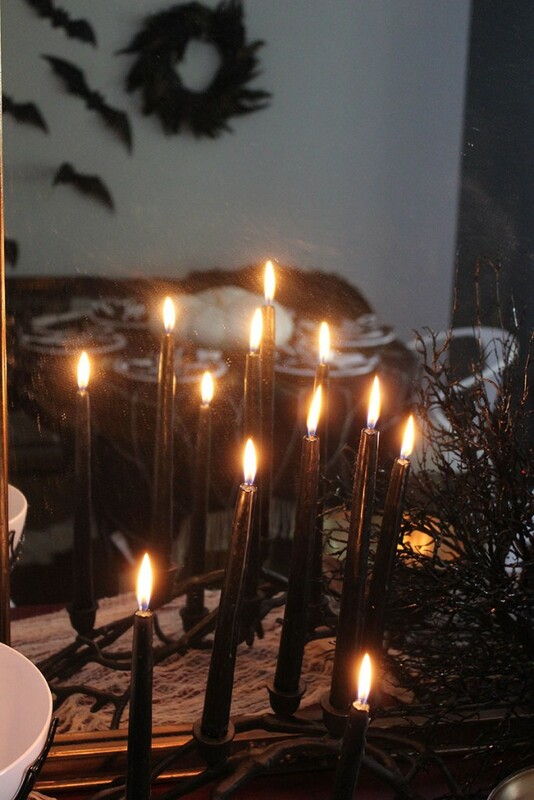 Then, layer on a black candelabra with black candles. 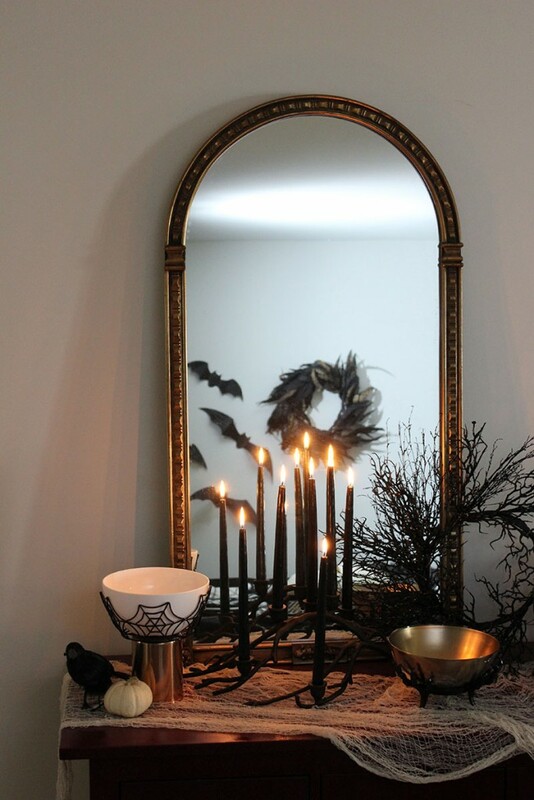 Lit candles always create magic, but layer them in front of a mirror for added effect. 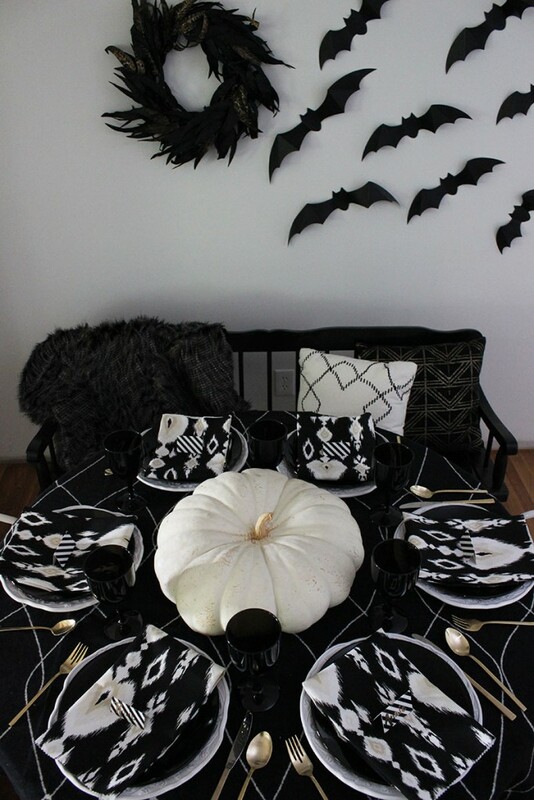 Then create a serving station with fun bowls and platters at different heights, drink service, and some fun seasonal details like a raven or two and pumpkins. The black tree branch wreath creates a simply spooky backdrop. 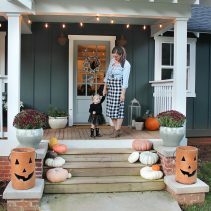 Thanks so much for stopping in and checking out this simple, modern take on Halloween party decor! You can find all sources and shop this post here. 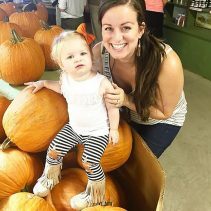 Make sure you hop on over to Happily Hughes tomorrow for some great costume inspiration. Thanks so much to Wayfair for putting this together! Black, White, Gold, Patterns, Simplicity, Whimsy & Magic! The perfect Halloween decoration combination. Great job. I need to buy more bats for my wall. The more the merrier! Love, love, love the black, white and gold color scheme! These decorations are bot easy to create and adorable.